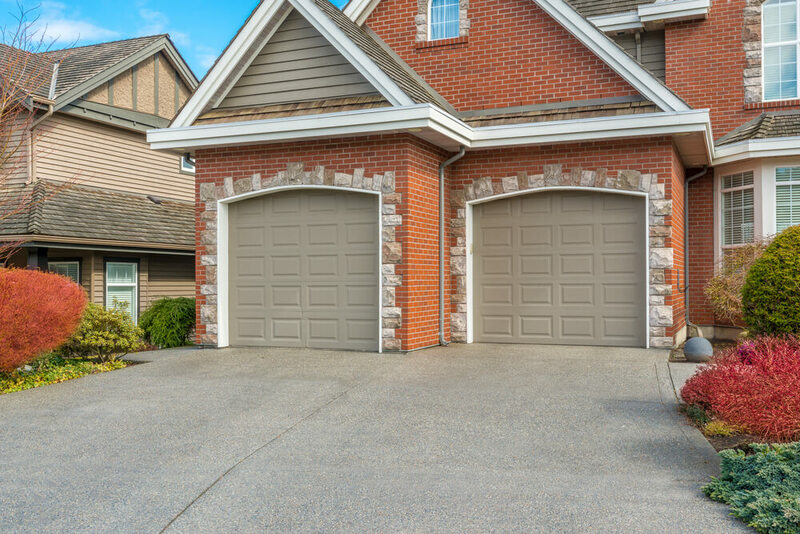 Garages aren’t the most exciting part of a home. But in our culture, they’re important and are a large part of most homes. 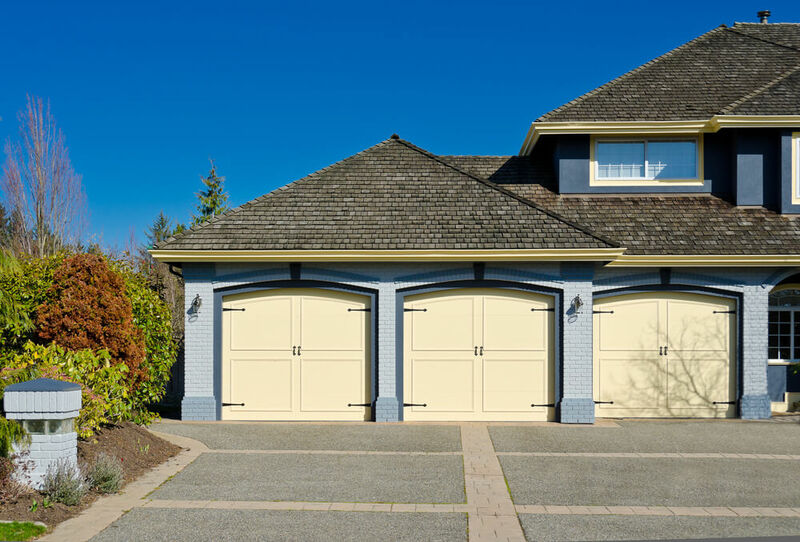 The good news is that today’s homes actually strive to make garages and garage doors look good… often replicating the design of the home. 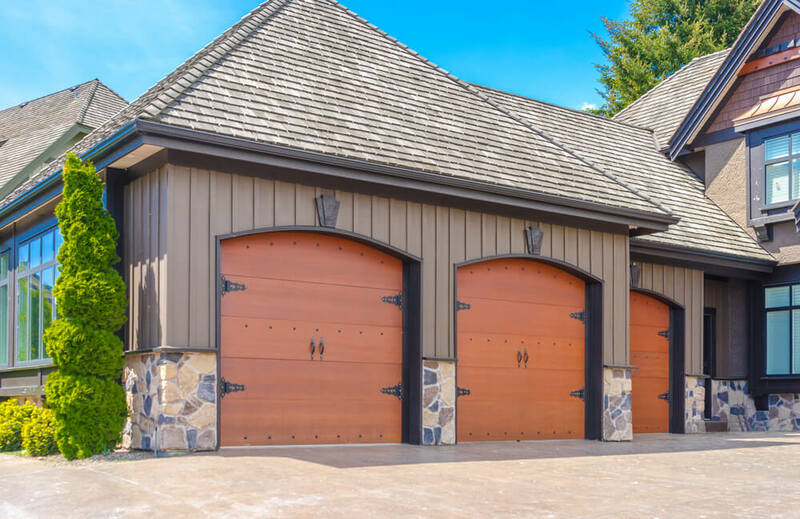 Our massive gallery of garage door designs includes pictures of many styles of nice garages and garage doors. Why nice? Because we want to give you many ideas of what’s possible with your garage. 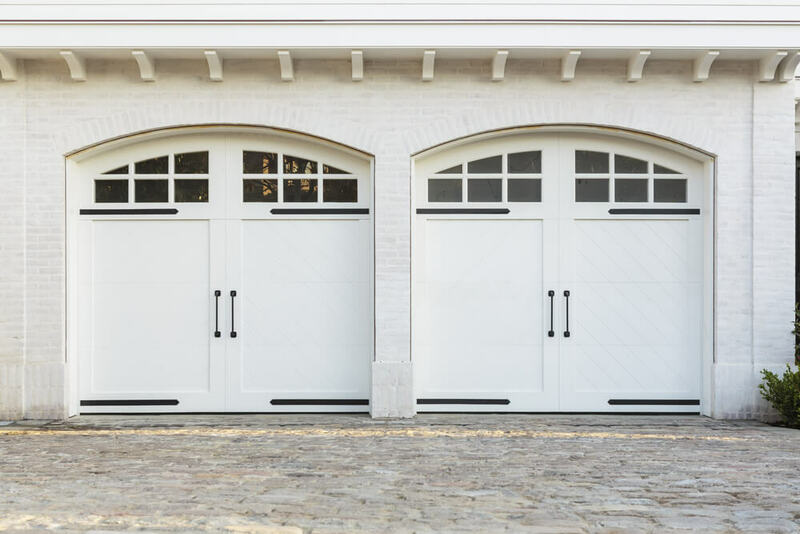 One big trend is going with carriage garage doors in an effort to make garages look like the old carriage houses of the 19th century. 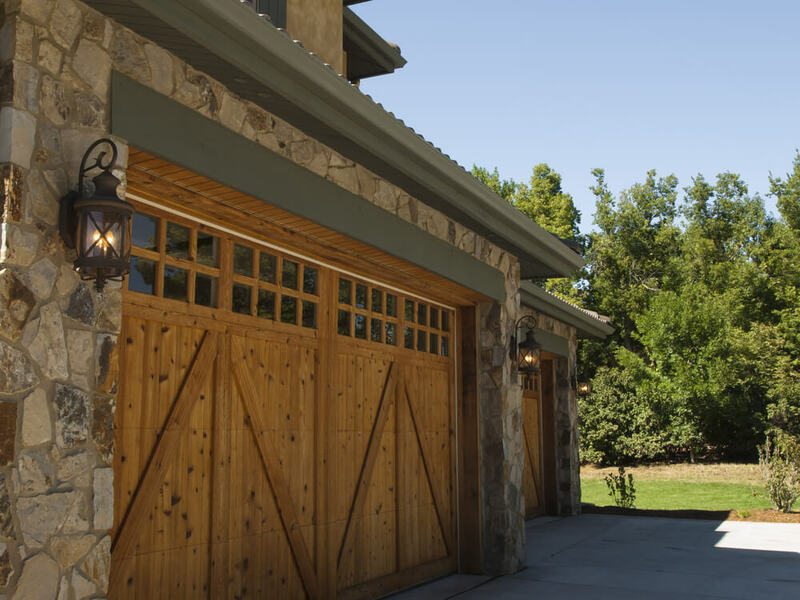 I’m a big fan, so you’ll see plenty of carriage style garage doors in our gallery. 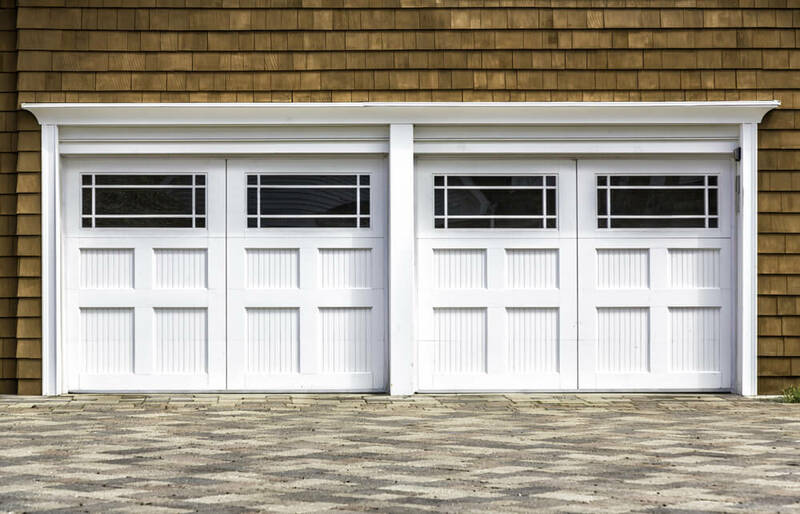 What are the best garage doors? I’m partial to wood in a carriage design. However, you may prefer a translucent (glass) door or aluminum. 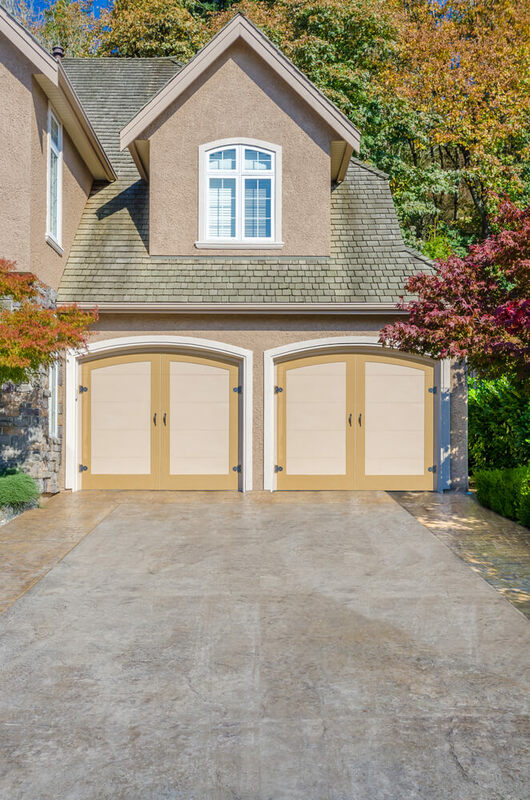 With respect to design, I prefer individual garage doors instead of large two car garage doors. They look better and that’s the design you get with a carriage design. 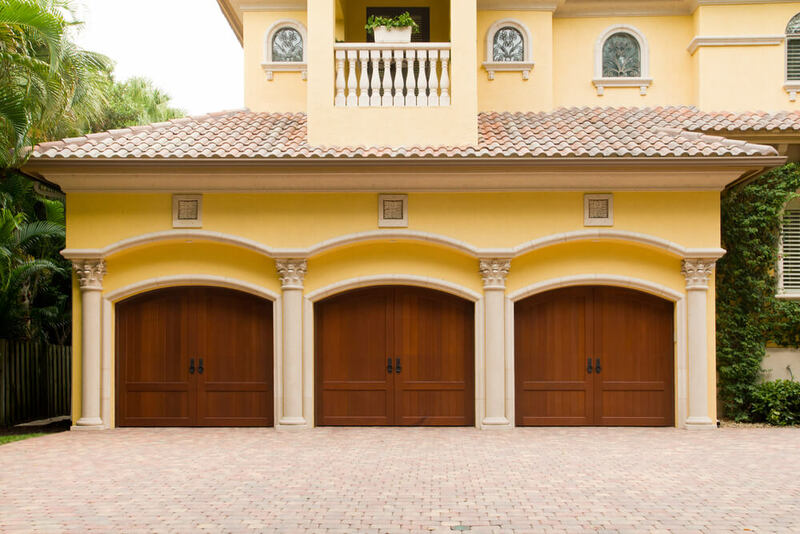 At the end of the day, the best garage doors are a matter of opinion. However, the key is to use quality materials and have them professional installed. Also be sure to research the latest technology available such as sensors for opening, heating options, remote control options, mobile device syncing and other “smart garage” technology. 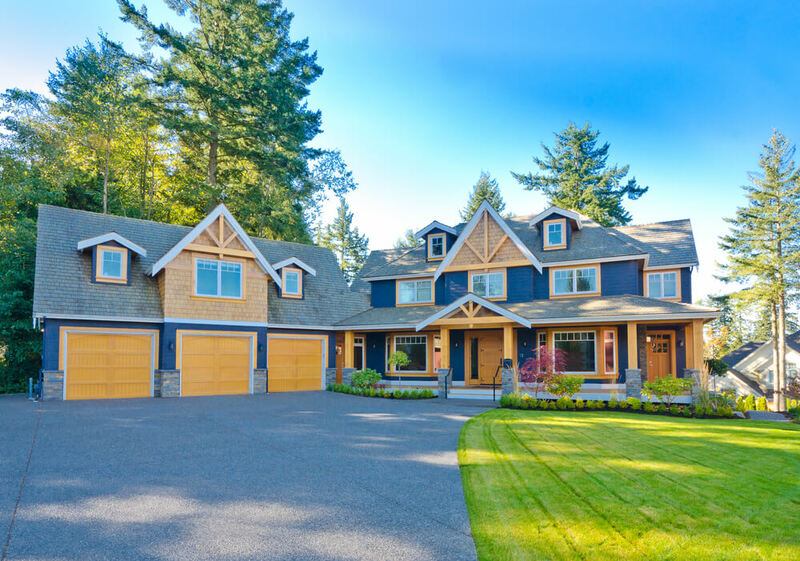 Obviously you’ll want to hire a professional garage installer or discuss these options with your home builder (if building a new home). 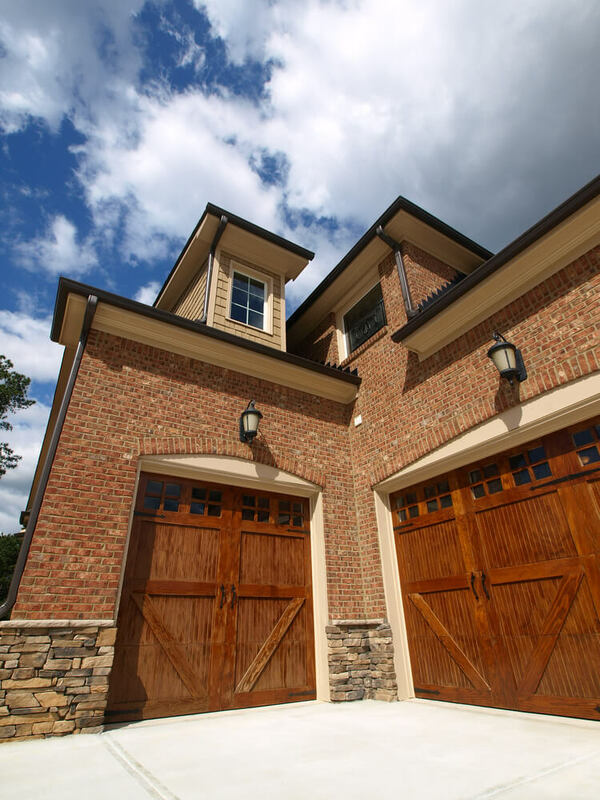 In some cases, adding windows to your garage doors can enhance the design as well… not always, but sometimes. 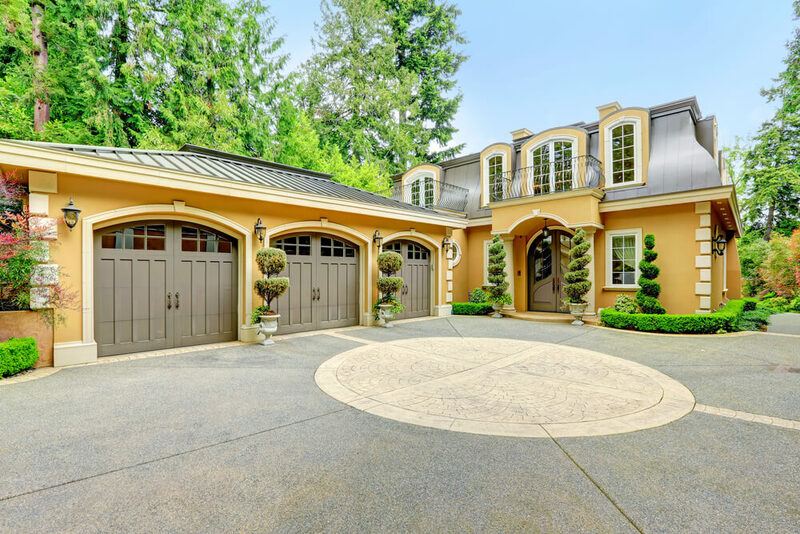 Our gallery below features many garage doors with windows. 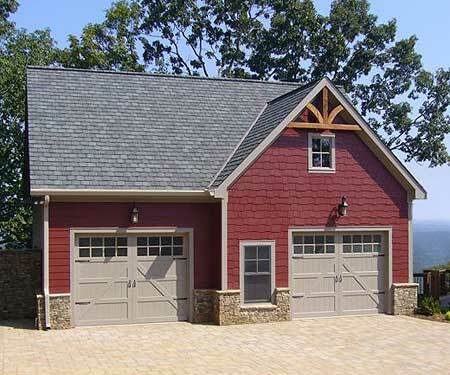 The main point of this gallery is to show you that your garage should not be an afterthought. 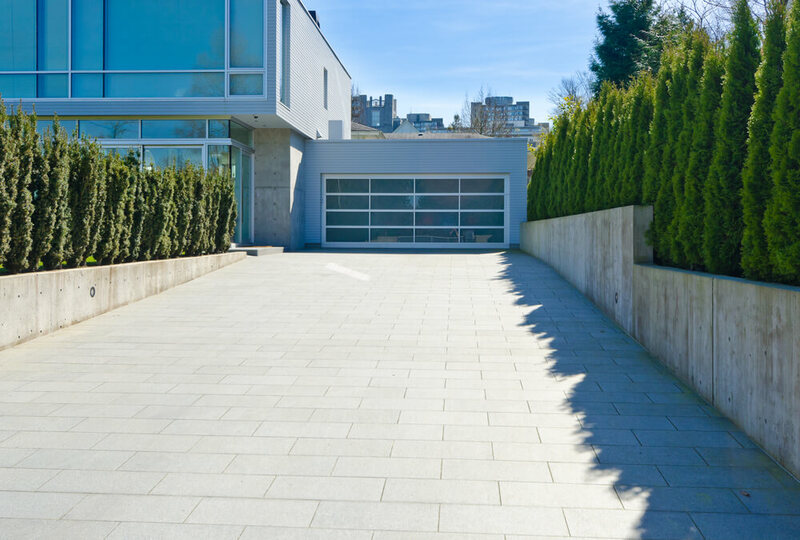 Instead, you should put as much emphasis on exterior and interior design into your garage as your home. Speaking of garage interior design – this is a wonderful opportunity to proactively create some great storage space for your home. Two vs. Three Car Garages? 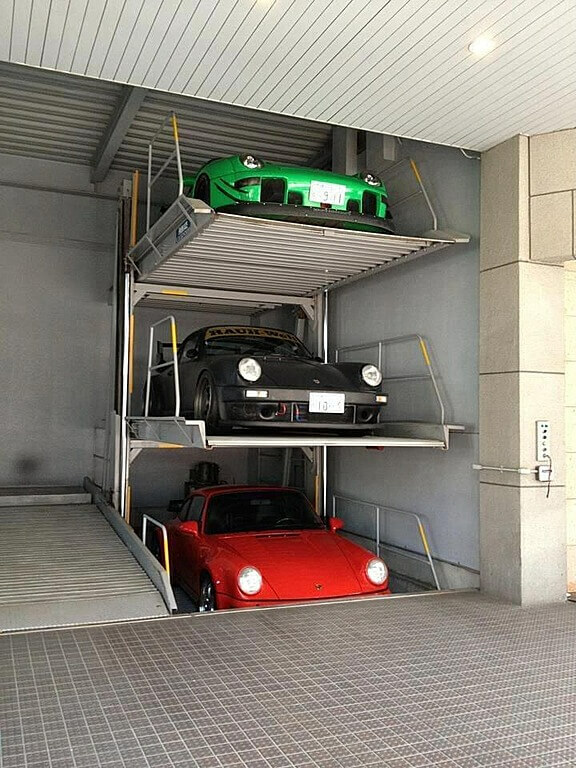 In my view, a three-car garage offers many benefits. 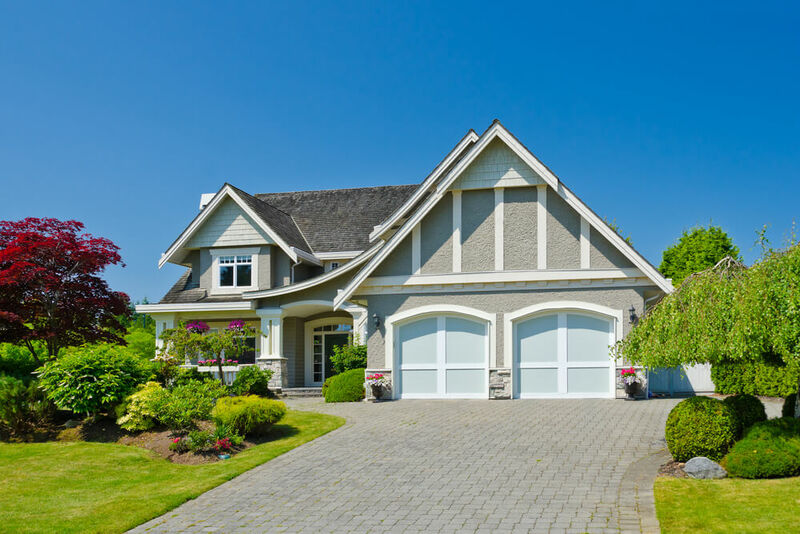 Even if you have two cars, you end up with a separate bay for storage, bicycles, recreational equipment, a shop … basically plenty of heated indoor space that can greatly enhance your home. 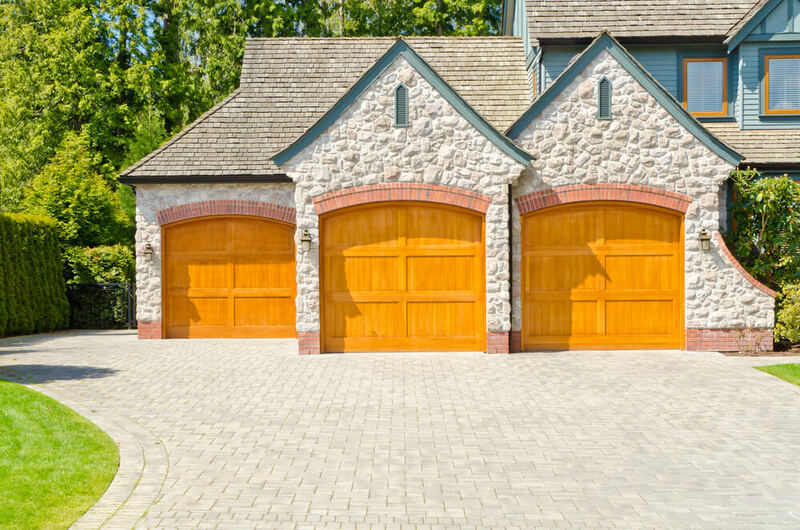 If your budget and property space permits, always go with a three (or four) car garage. 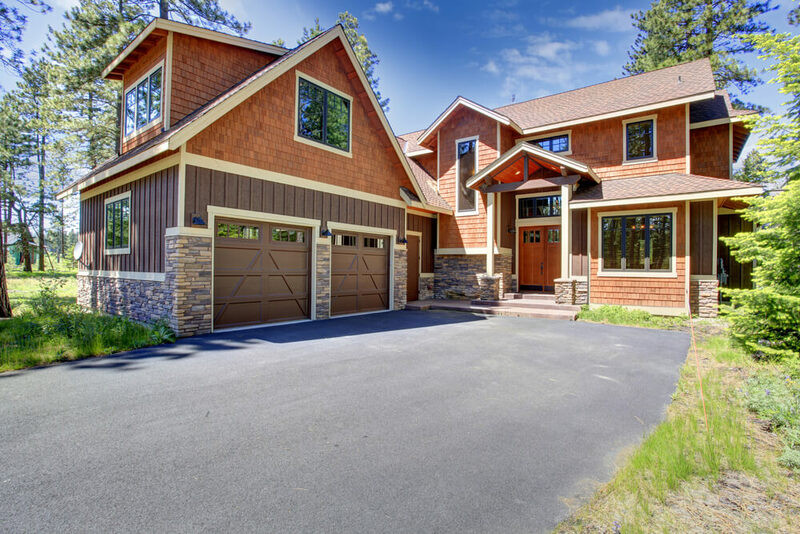 This attached, front facing two car garage in black wood features overhead windows and wall sconce lighting. 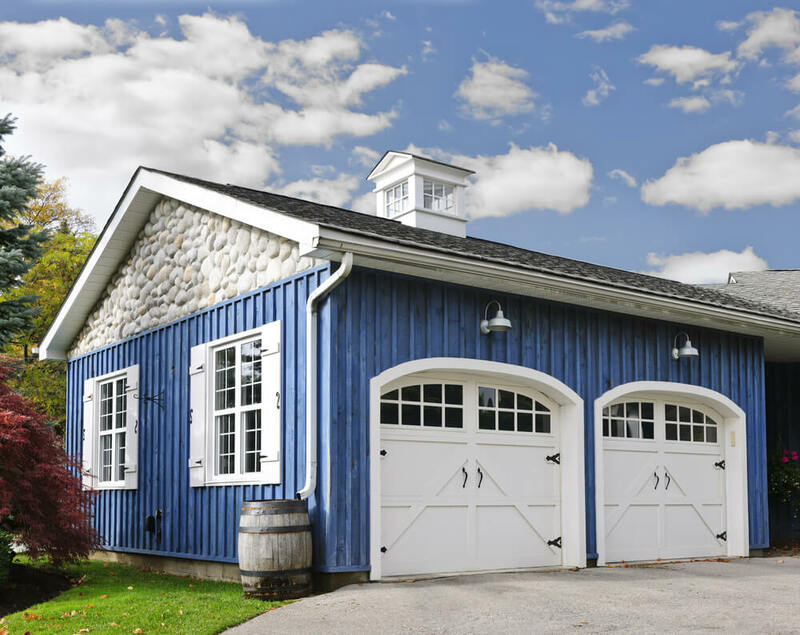 Here we have a white, two car carriage-style garage with black mounting hardware and upper window panels, in a sky blue attached garage. 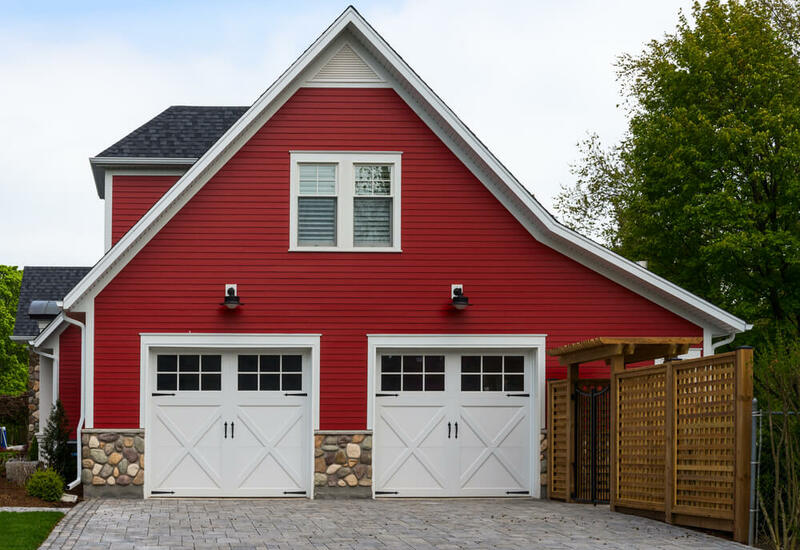 This red, side facing garage features two car carriage-style doors in white wood, with upper panel windows and overhang lights. 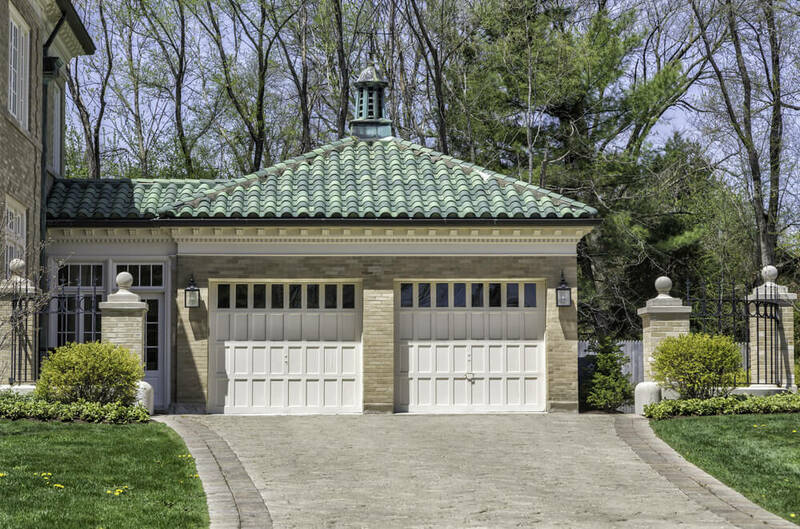 This brick home features unique garage with doors facing two angles of a corner: single wood carriage style door to the left, and double size matching door to the right. 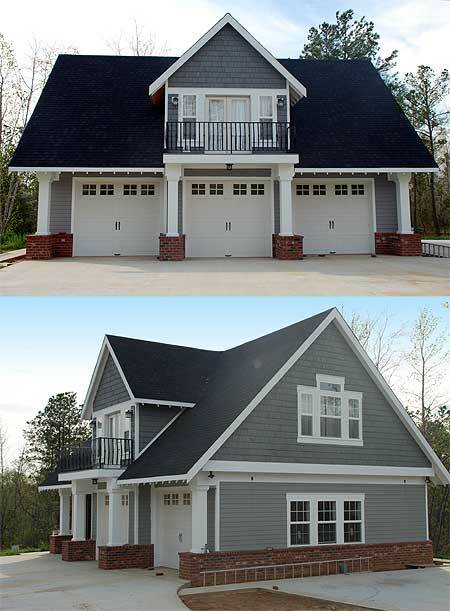 This grey and white home features an attached, front facing two car garage with painted wood doors in white and light blue. 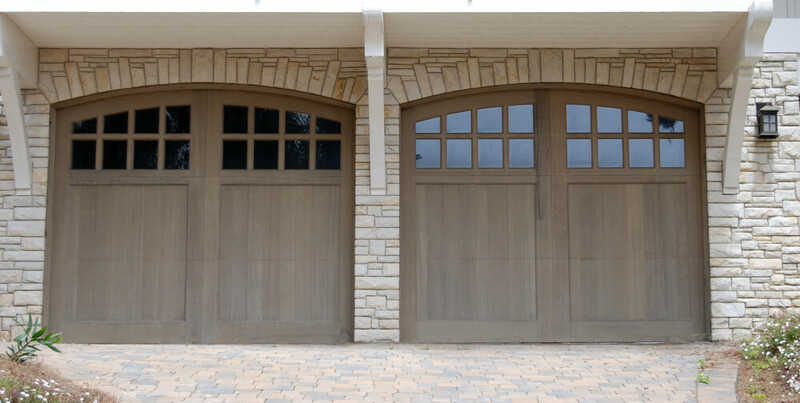 Large stone structure holds this two car garage, featuring warm natural hardwood carriage style doors in arched brick frames. 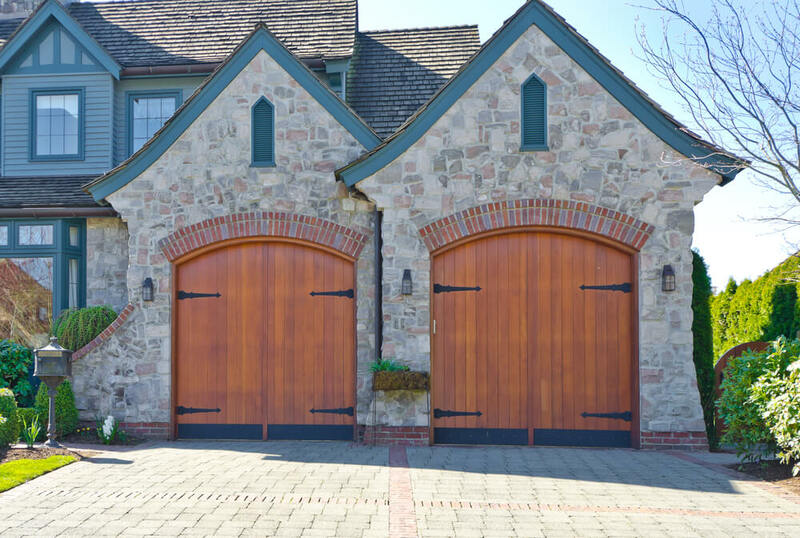 Garage featuring twin arched carriage style doors in dark stained natural wood, flanked by ornate sconce lamps. 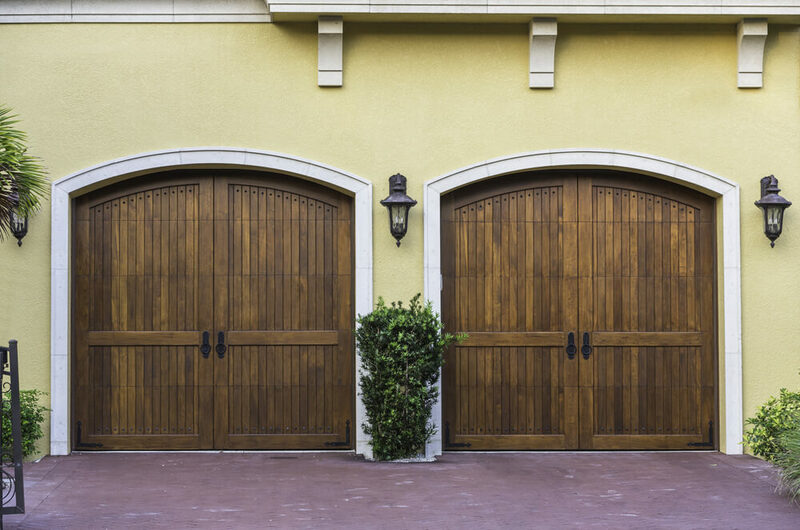 Here we have an attached, front facing two car garage, with carriage-style doors painted beige and yellow, framed in white wood on a stucco wall. 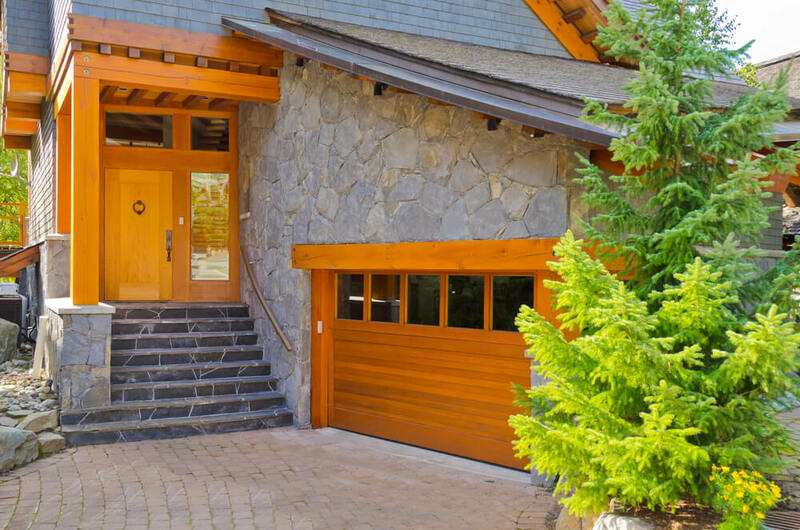 Predominantly brown home featuring two car front-extension garage, with natural wood doors matching the home’s framing, sandwiched between lower stone walls. 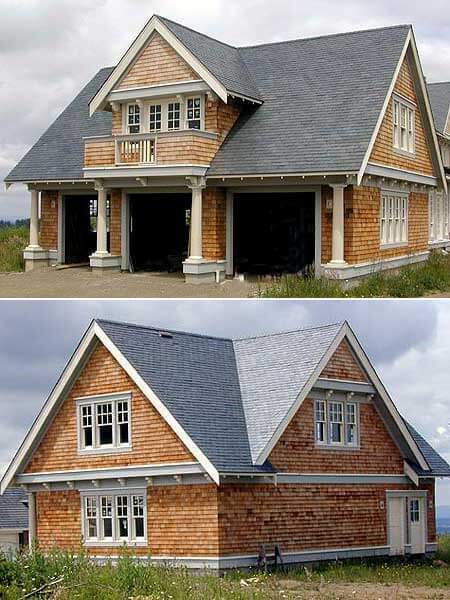 Natural wood shingle siding surrounds this two car garage in white painted wood, featuring large upper panel window design. 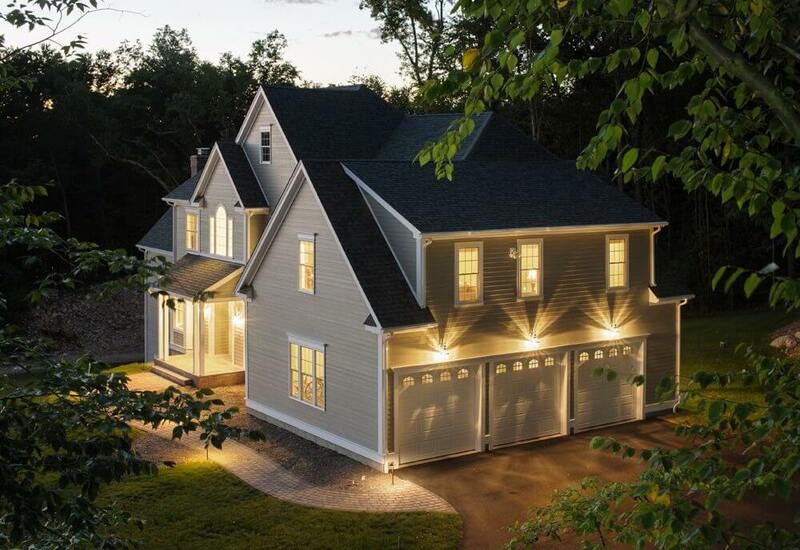 This front facing, attached garage on light brick home features upper-panel white framed windows on dark brown aluminum doors, flanked by light sconces. 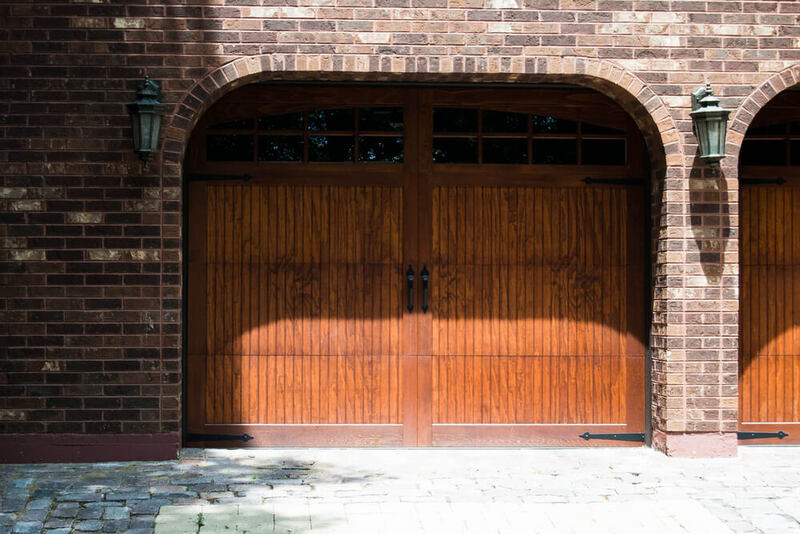 Arched brick design frames this two car garage with carriage style doors in natural warm wood tones, featuring upper panel wide window design. 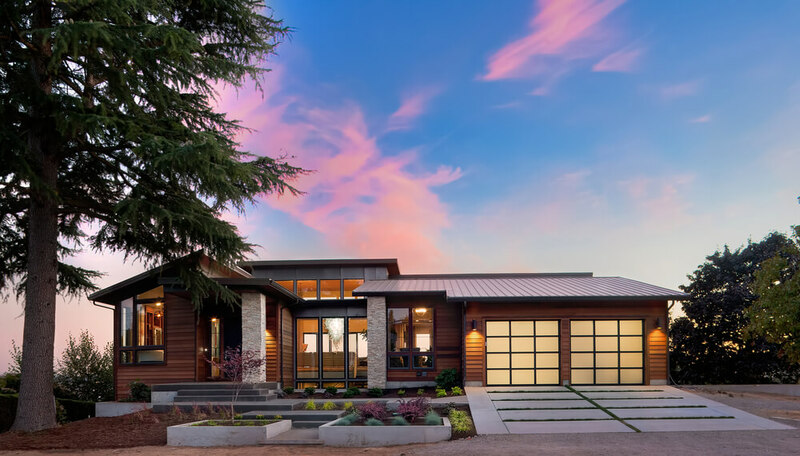 This modern home features a single extra-wide white garage door for two cars, on white wall area topped with dark wood paneling. 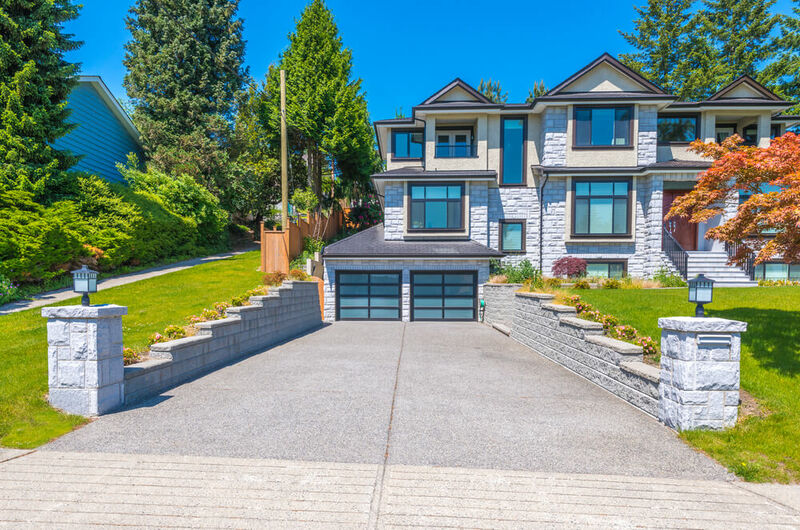 Stone facade home features bright toned natural wood throughout structure, including side facing garage door and frame, with large upper panel windows. 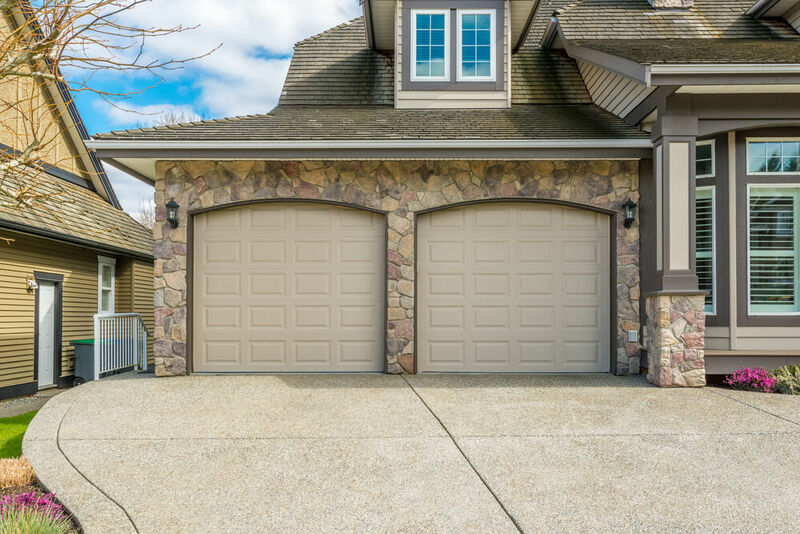 Here’s a great example of an attached, inside-facing garage. This example has lower stone and upper wood facade surrounding white framed, brown wood doors with upper window panels. Traditional red brick home features front-extension, staggered two door garage, with brown aluminum doors framed in stone bricks. 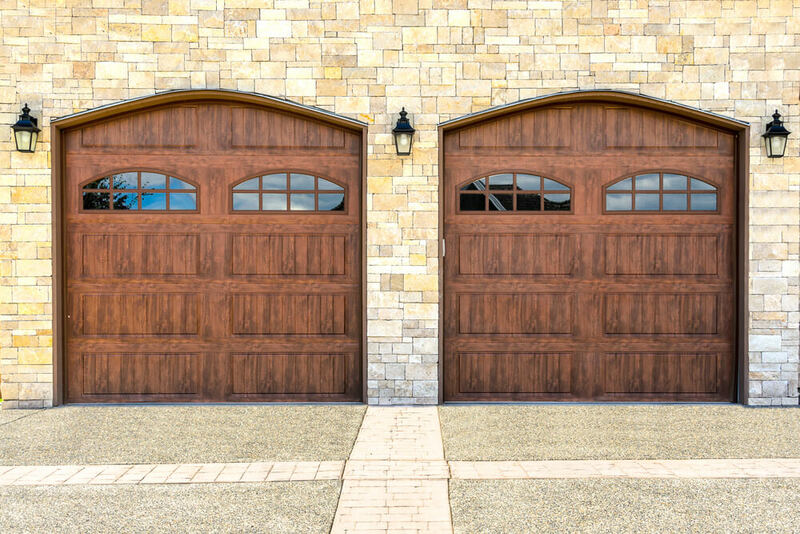 Two car garage features natural wood arched doors with upper panel windows, nestled in light stone brick facade beneath white wood overhang. 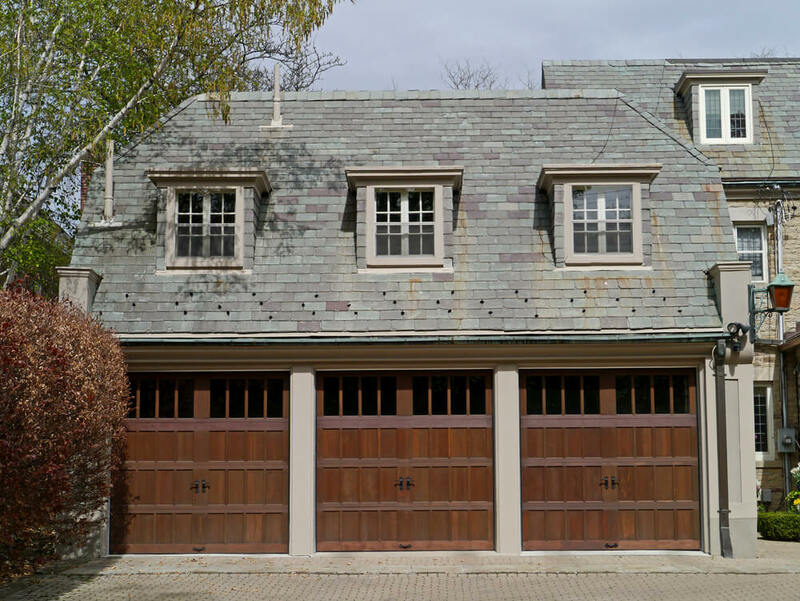 Attached, front facing garage with stone facade features two light-brown aluminum doors seated between black sconce lighting. 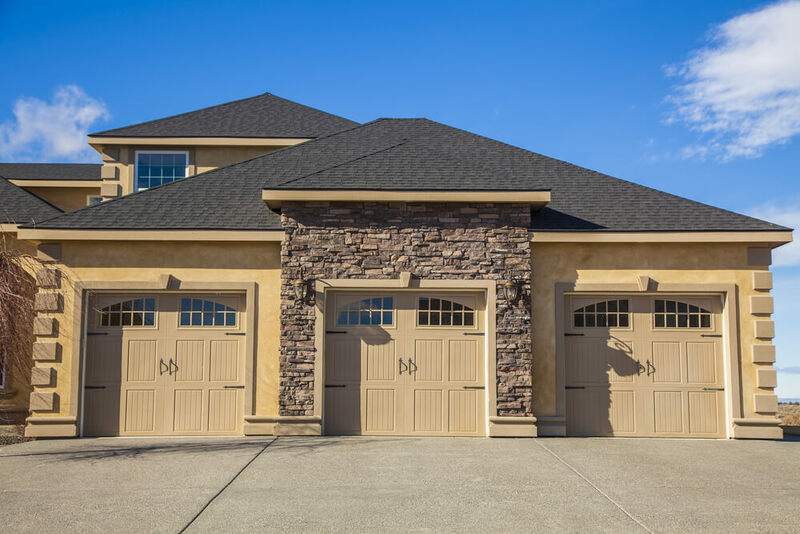 Stone brick home featuring two car dark wood garage doors with 3/4 height window panels. 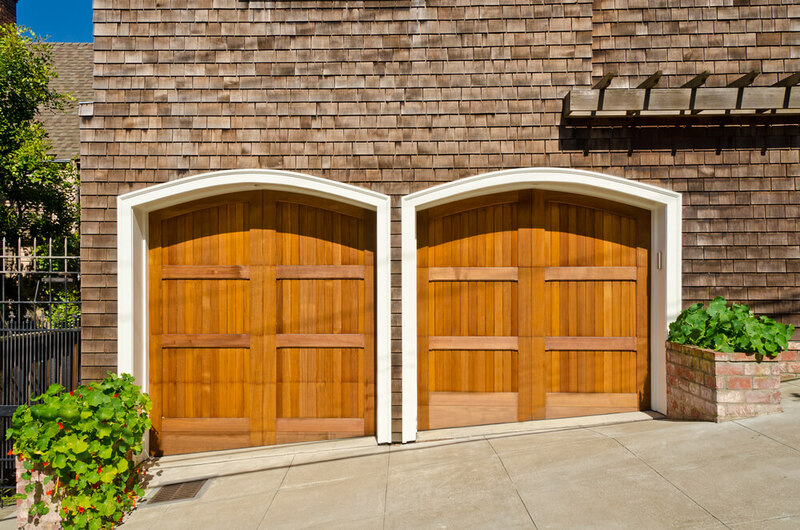 This side-facing garage features two light natural wood doors in arched, white frame. 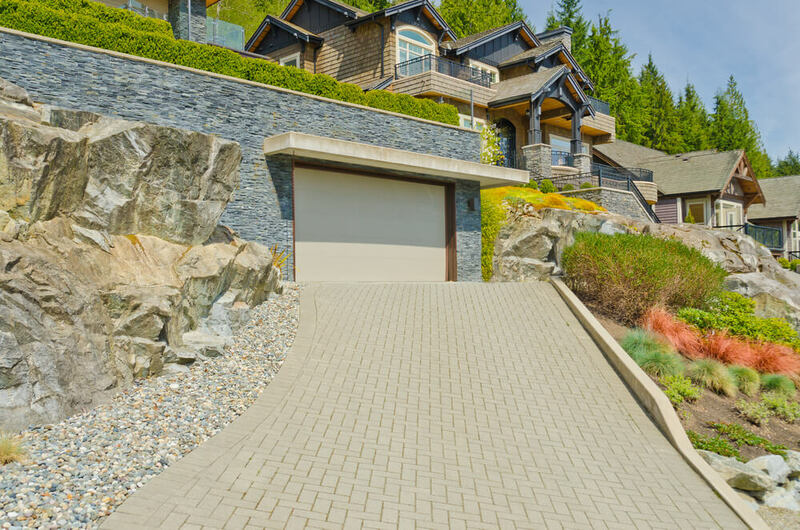 Custom shape accommodates sloped driveway. This bright white brick home features two car garage with white painted wood carriage style doors in arched brick frame. 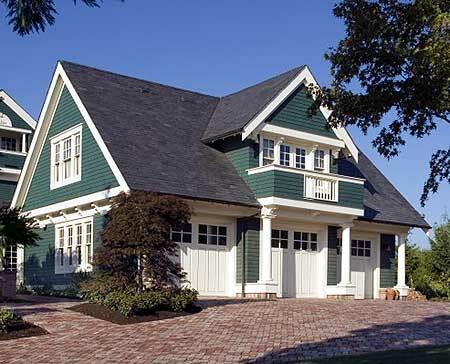 Here we have an attached, front facing garage with two car doors in light wood, with small window panels on top, under unique green curved shingle roof. 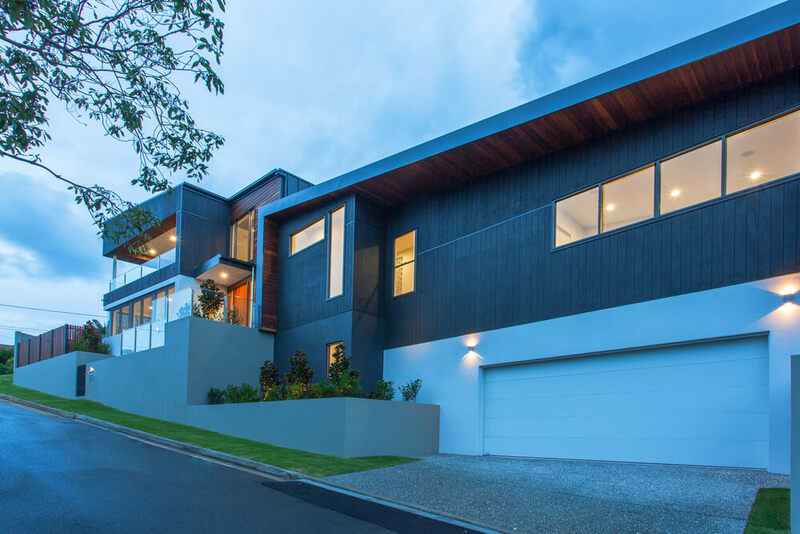 This modern home in natural wood features an attached, two car garage with smoked glass door panels framed in black. 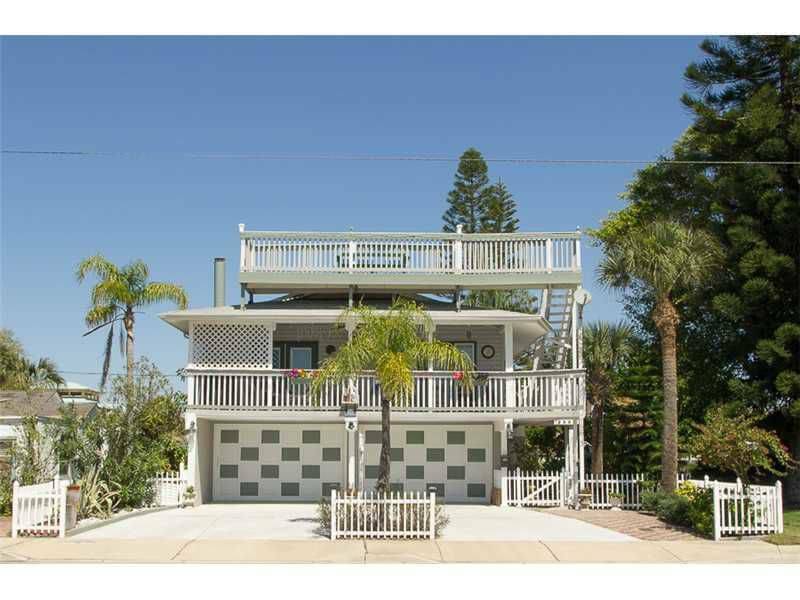 Large brick home features lower level two car garage with single large smoked glass door, framed in white. 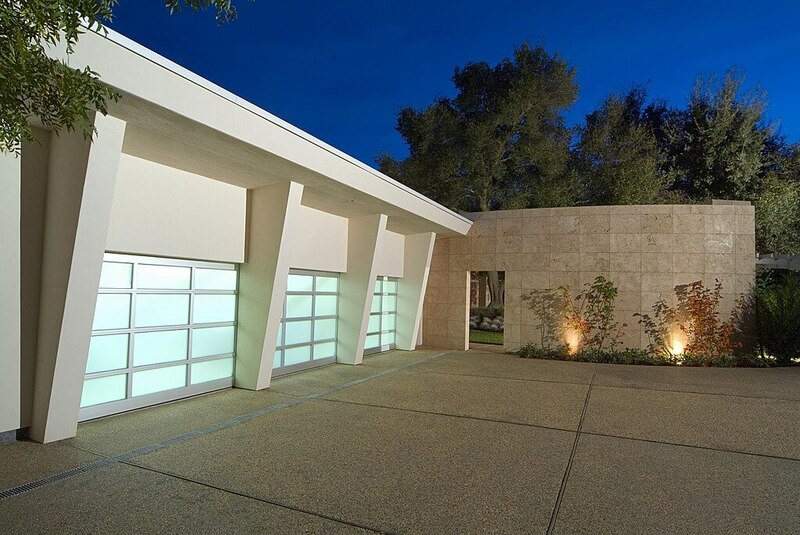 Lengthy brick drive leads to this attached garage, featuring smoked glass two-car door framed in white. 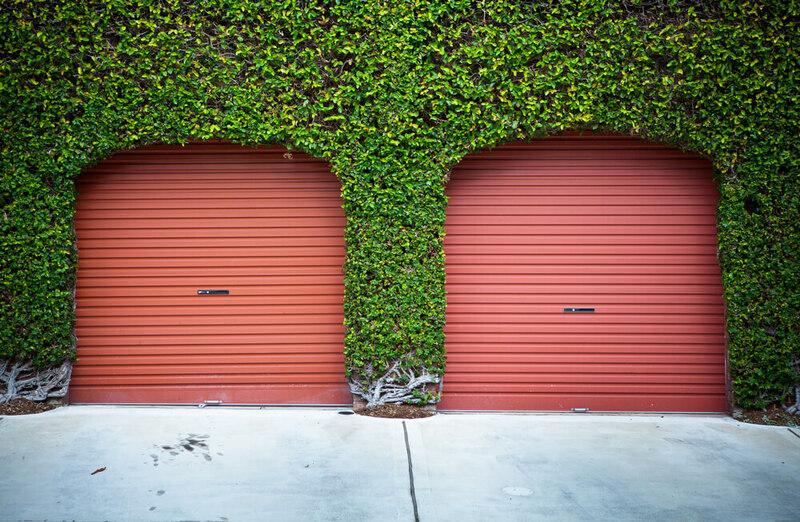 Two red aluminum garage doors on this home are framed in ivy facade for unique, bold look. 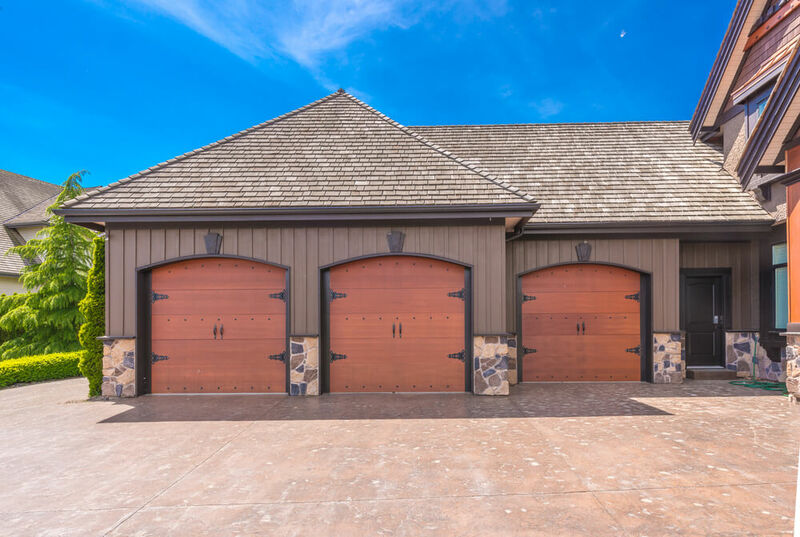 This first three car garage features staggered design, with two of the light natural wood doors up front and a third recessed on the left. Red brick arches frame the doors under stone facade. 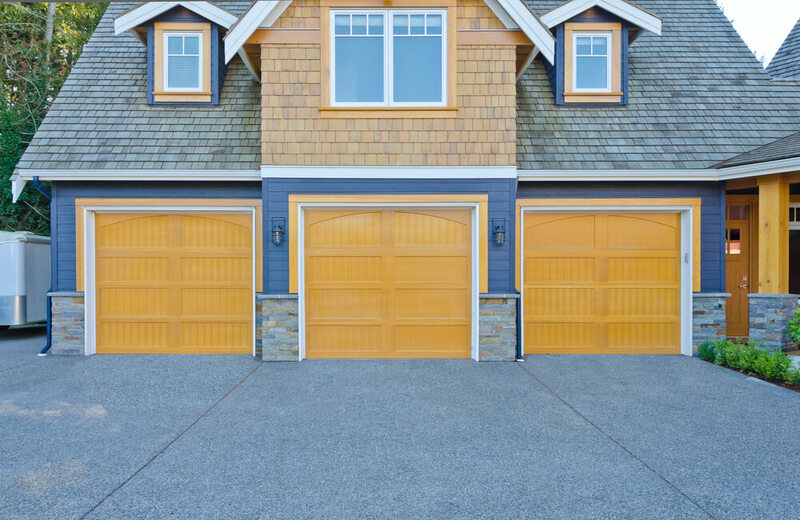 This blue and gold hued home features attached, inward-facing three car garage, with wood paneled doors framed in blue. Here’s a close-up view of the same garage. Notice the gold painted wood sandwiching subtle white frames, and the lower wall stone facade. 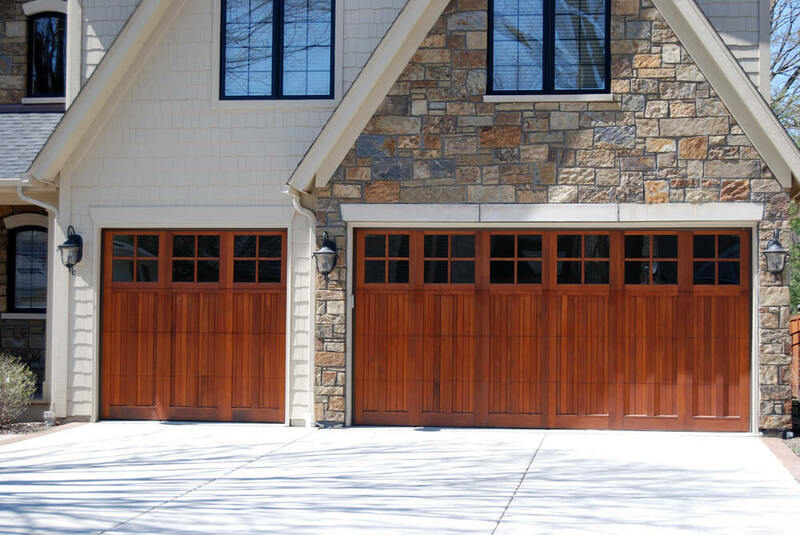 This attached, inward-facing garage frames three natural wood doors with smoked glass upper panels in stone brick. Front-extension garage features yellow facade with white bricks and columns surrounding 3 natural wood carriage style doors. 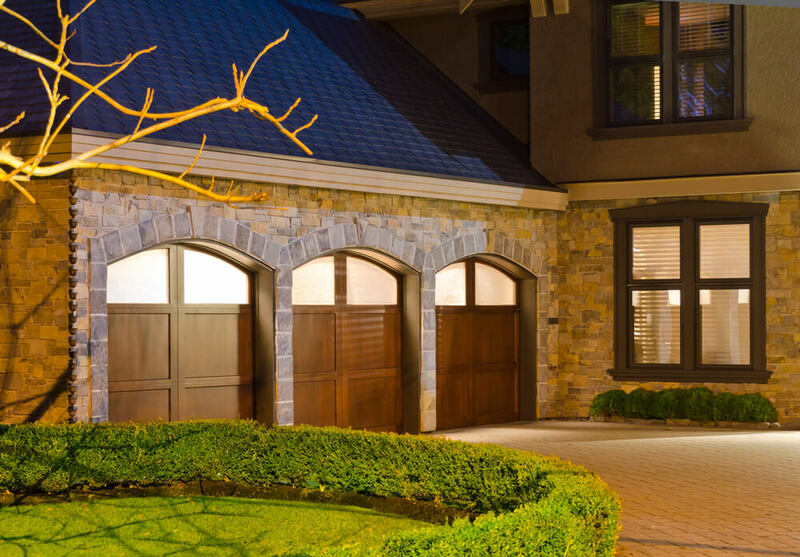 White stone brick home features three car garage, with black door panels under arched stone lintels and metal light sconces. 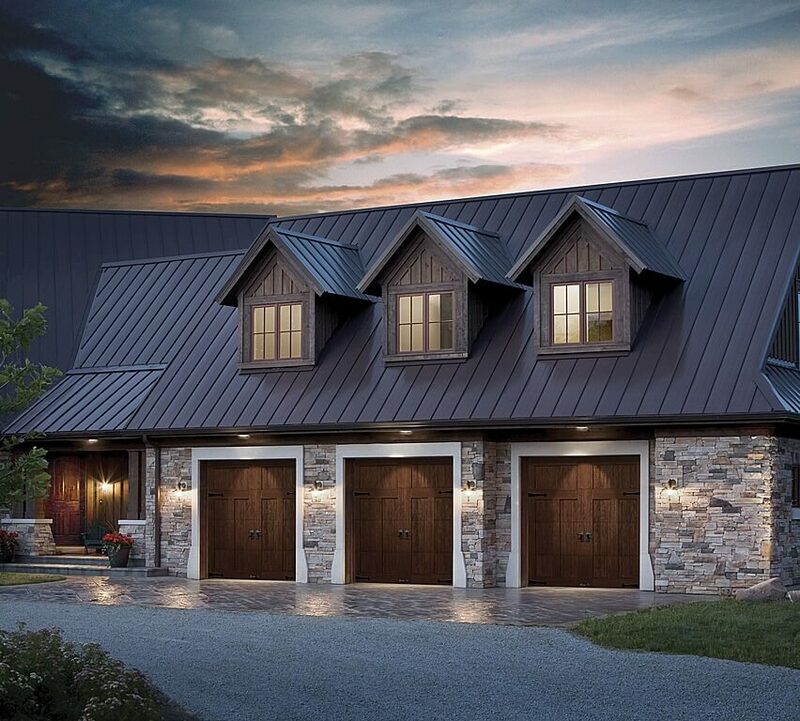 Rustic look of this home is amplified by natural wood garage doors featuring upper panel windows and flanked by sconces. 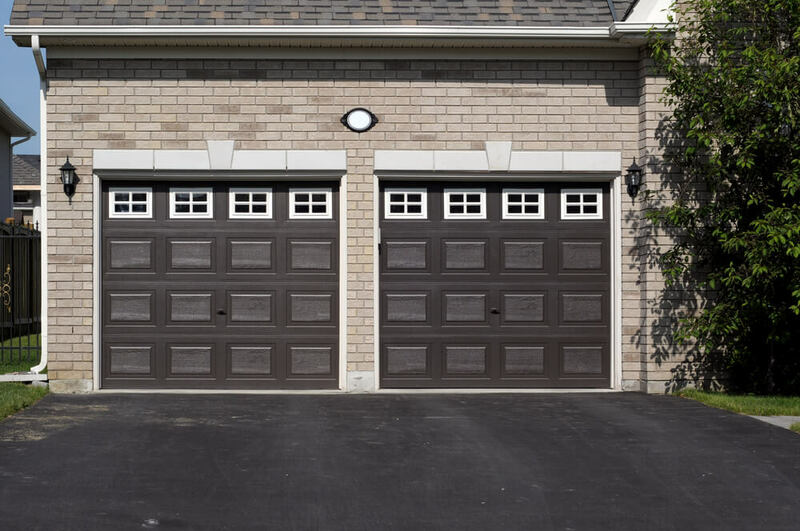 This front-extension three car garage features carriage style dark natural wood doors with upper panel slot windows. 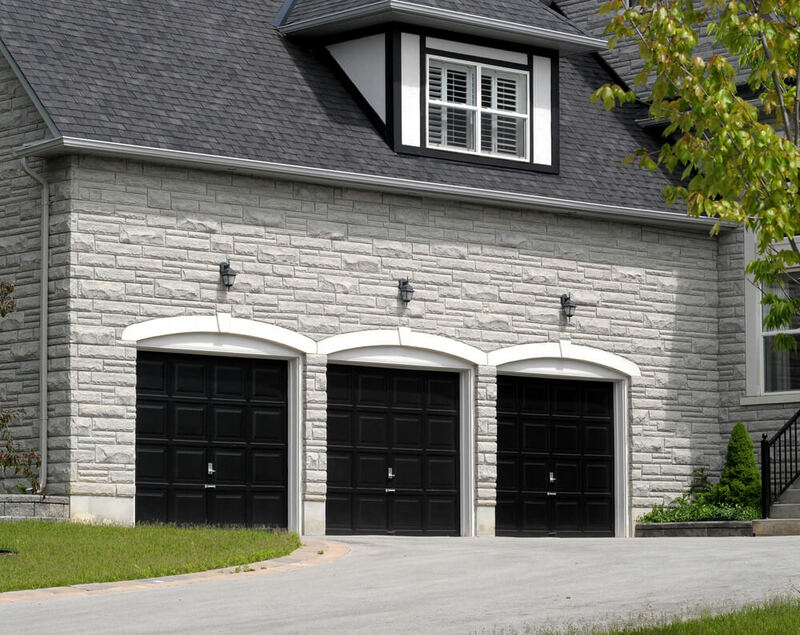 This side facing three car garage features bright natural wood carriage style doors, framed in black, with lower level stone facade wall. Here we have a head-on view of the previous garage. Note the recessed third stall on the right. This blue brick home features an attached three car garage with light yellow painted wood carriage style doors under arched brick. Front-extension garage here features unique design with stone facade surrounding central stall. Light brown painted carriage style wood doors feature upper-panel windows. Three car, front facing attached garage splits stalls into two doors, with single car on left and double-stall on right. Doors are rich natural wood with upper panel windows. 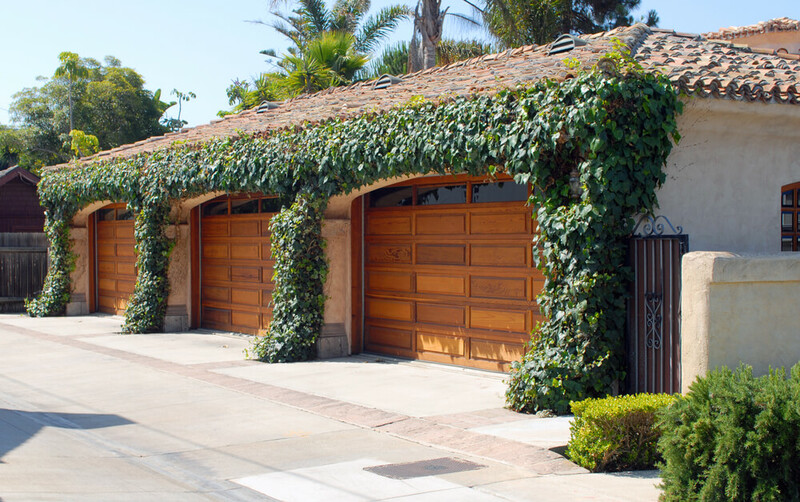 Side-facing garage frames three natural wood doors in ivy-covered adobe facade under Spanish tile roof. 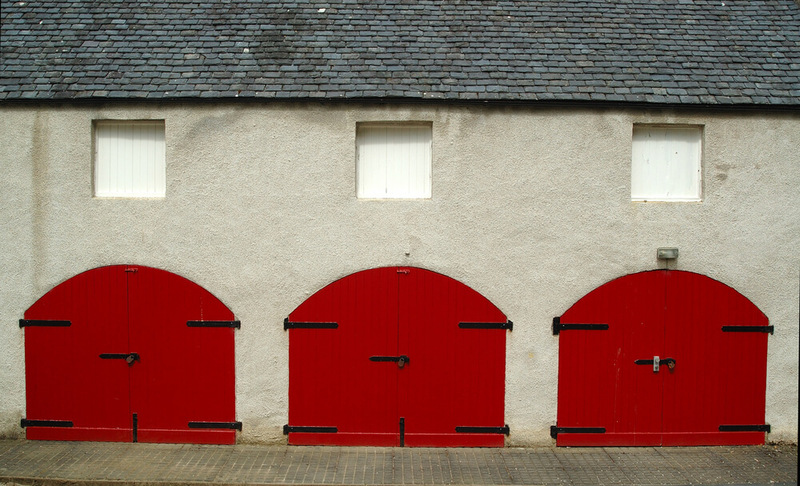 Bold red painted carriage style doors adorn this three stall garage under stucco walls. This rustic look home features front facing garage under large upper balcony, with natural wood doors featuring upper panel windows. 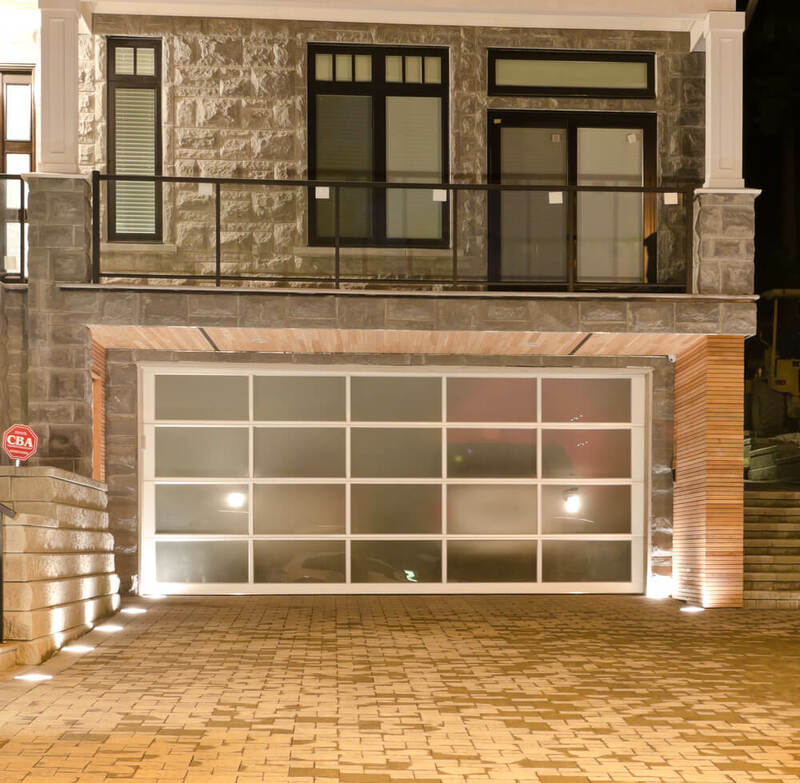 Bold light stone brick home features attached, under home garage with twin smoked glass panel doors framed in black. Discreet single door garage sits under hedge rows, surrounded by large stones in this home. Flat concrete overhang provides shade for beige toned door. 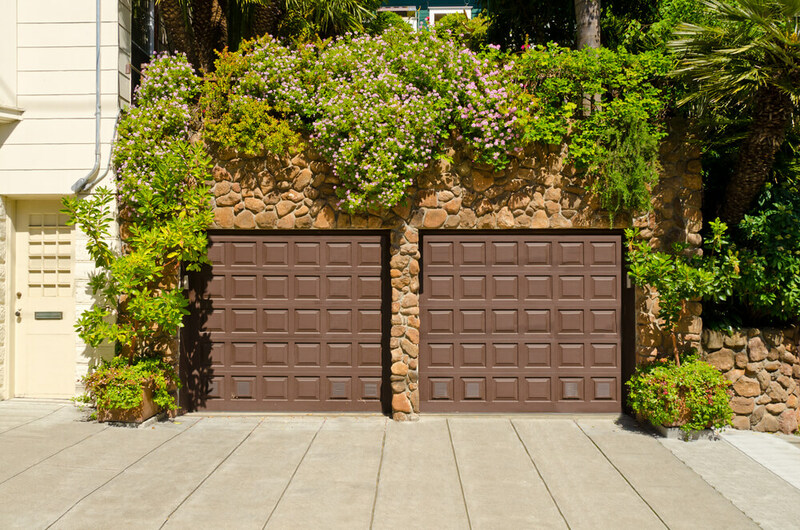 This stone facade garage is nearly hidden beneath vegetation, with brown square paneled doors.
. 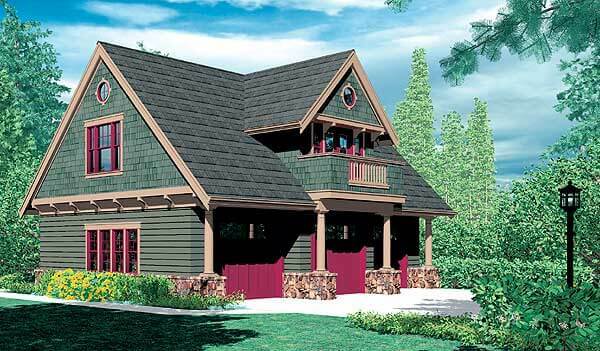 This carriage house in forest green and bold red features three garage doors with upper panel windows under second floor balcony.
. 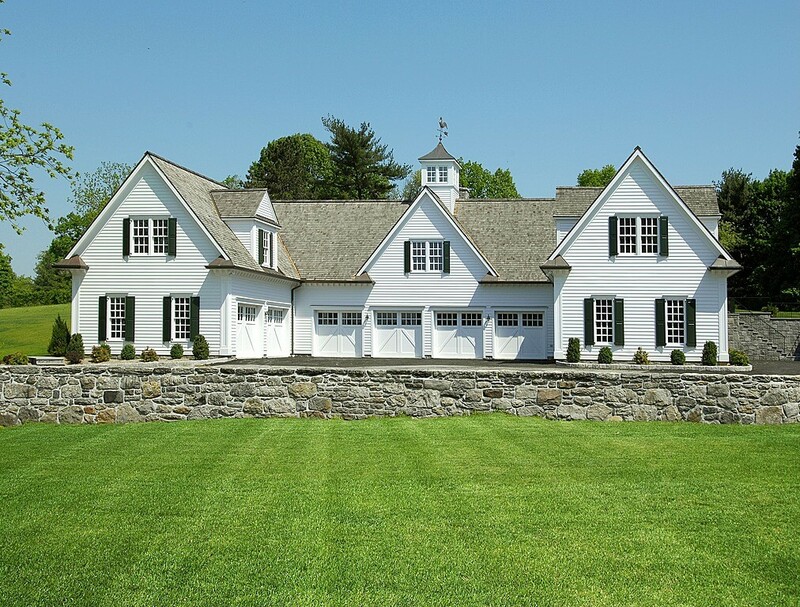 This similar three stall carriage house features white carriage-style garage doors separated by white columns under balcony.
. Natural wood shingle carriage house with three stall garage separated by white columns.
. Green and white three stall carriage house features upper panel windows on white garage doors, white pillars, and upper level balcony.
. Cozy red shingle carriage house features two stalls separated by central window, with brown painted wood carriage style doors. 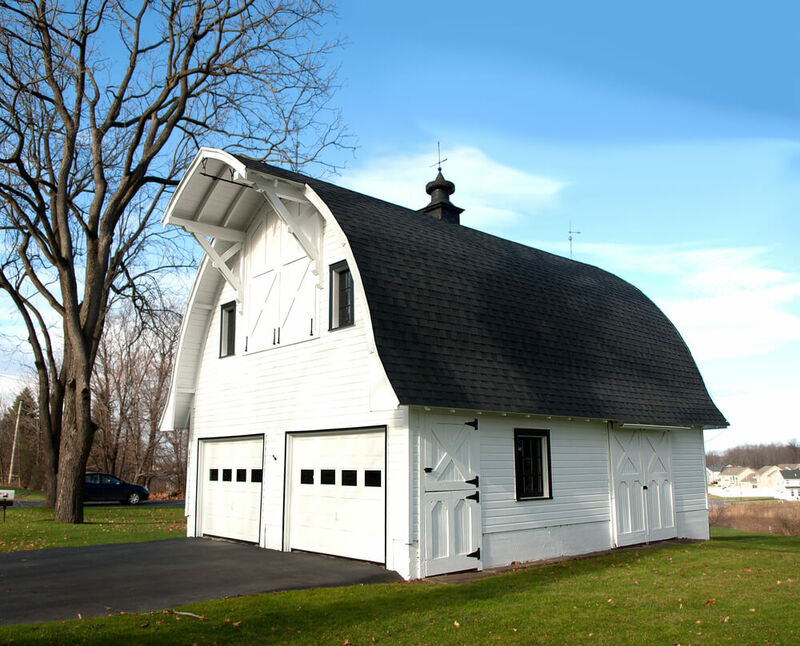 Arched roof barn style carriage house in white features two stall matching garage doors with 3/4 height window panes. 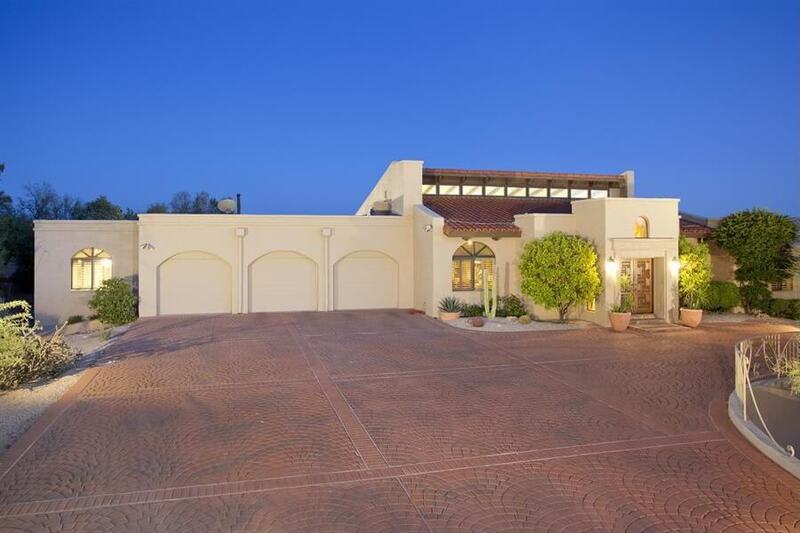 We end our gallery with a huge mansion with a drive-through garage. 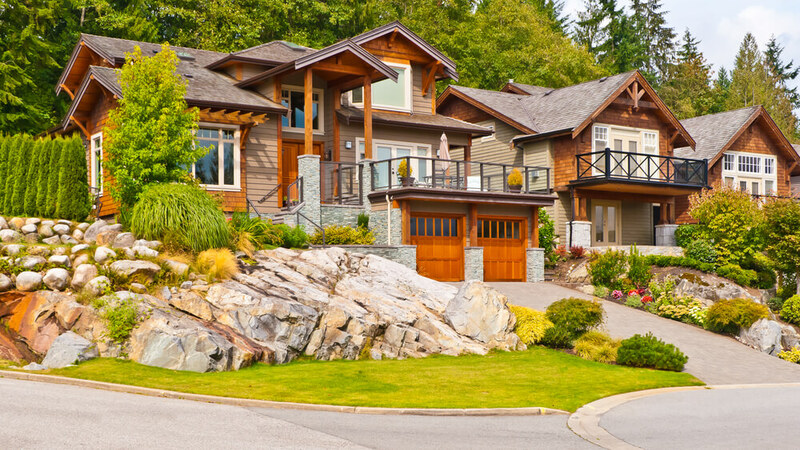 Unfortunately, not all of us can afford such a property, but it sure looks great.